Pictures comparing good and bad behavior seem to have always been popular. From William Hogarth's Industrious and Idle 'Prentices to Goofus and Gallant, the moralizing, warning tone is often mitigated with a certain sneaking suspicion that while the good may succeed, the bad have more fun. These two French prints turn the ever-popular theme into a generational battle. The work of printmaker Louis Simon Lempereur (1728-1807), the pair would likely have been purchased together and hung side by side for an effect both moral and sentimental. As always, click on the images to enlarge them. 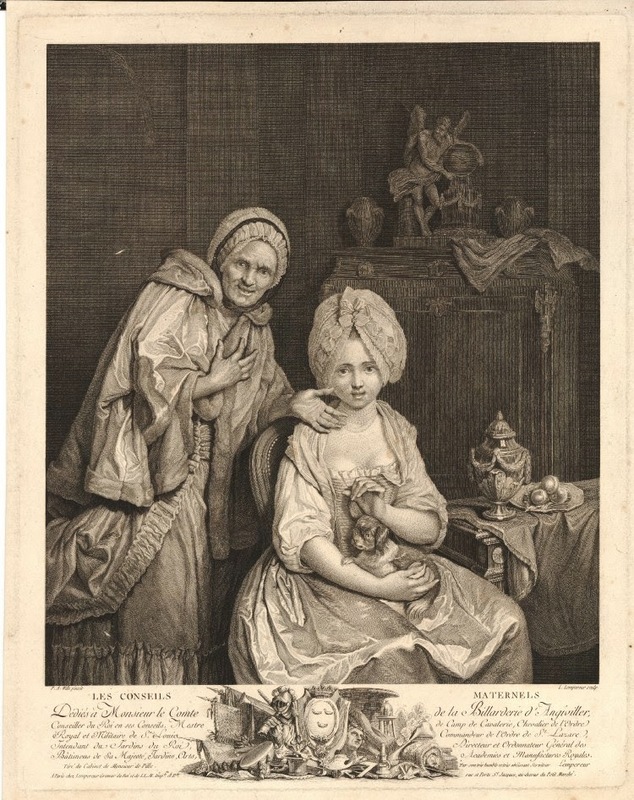 Les conseils maternels ("The Wise Mother"), above, bows slightly as she proudly presents her daughter to the viewer - and perhaps, to a future husband. And what a model daughter she has raised! The girl has perfect posture in a straight-backed chair, and she's tightly laced into her stays (corset). Her hair is demurely hidden beneath her fashionably ruffled cap, and she holds a small dog in her lap, a symbol of fidelity, and likely also hinting at the girl's future as a wise mother herself. her only ornament are strands of pearls, another sign of purity. Most of all, the daughter is the picture of slightly simple-minded innocence itself, her round eyes and cheeks and empty expression that's cloyingly sweet. It's a different story with La mère indulgente ("The Indulgent Mother"), below. This mother attempts to speak with her teenaged daughter, which is clearly futile. Her daughter is the classic eye-rolling teenager, sulky and spoiled. The girl is slouching languidly in her armchair, and her slack posture would have said Trouble with a capital T to an 18th c. audience. Other clues are her unkempt dress; it appears she's not wearing stays beneath her bodice, and she's lounging vainly before her dressing table and looking glass. The open drawers and untied ribbons also hint at lost virginity, as does the unpinned pinner (that's the flap that's lying in her lap, the upper part of her apron that in a modest woman would be pinned to the front of her bodice.) The silver pot is for hot chocolate, and the empty cup implies that she's been lolling about in her bedchamber long enough to drink a great deal of the sweet beverage. Worst of all, there's a love-letter in her hand. Uh-oh. None of this seems to distress the mother, however, who looks almost as if she's advising her daughter on her love-life. Something else that caught my eye in these prints is how the mothers are portrayed: to modern eyes, they look really, really old. Considering the age of the daughters (under twenty?) and that Frenchwomen tended to marry young in the 18th c., these women are likely in their forties at the most, and probably younger. Yet their faces and hands are deeply lined and they're missing teeth. At least the wise mother is as fashionably dressed as her daughter. This could be to make the young daughters more appealing in contrast. It may also be a valid representation of how much more dramatically women would have aged in a time when illness, nutrition, and childbearing took their toll, a time when "a tooth for every child" was expected. Or (and this is a guess) it may also be an example of 18th c. sexism and ageism, with the mothers aged to emphasize how sexually unappetizing older women were considered when compared to the nubile ideal of the Rococo. Top: Les conseils maternels, by Louis Simon Lempereur, c.1777. The British Museum. Bottom: La mère indulgente, by Louis Simon Lempereur, c.1775. The British Museum. For some reason, I like the second picture more - both the mother and the daughter look more human, and I don't mean that because of their un-saintliness. It's about the the expression in their faces... The mother in the first looks hungry, hungry to offer her daughter, and the daughter's eyes - they don't seem just empty and sweet, they seem... scared, unwilling. I like your interpretation, Ana. There's something subservient in the way the wise mother is bending over, her hand on her breast, and the girl does look scared. Maybe she's meeting the wealthy, older (and creepy) man that her parents have arranged for her to marry? Neither picture is appealing. As to how aged the mother looks-- I have been reading novels for many decades. 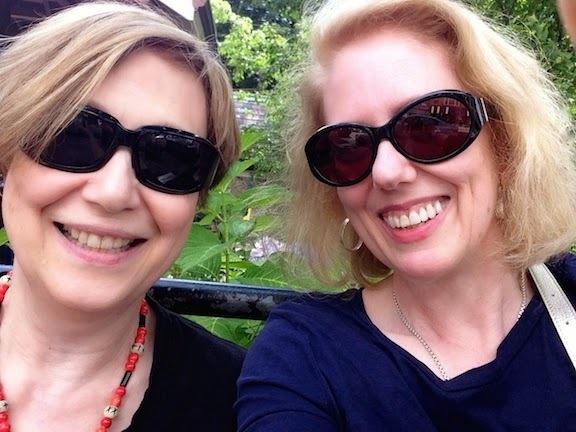 As I have aged I started to notice that many of the books in the 1950s, 60s and on, described all the parents of marriage age daughters as being grey haired. A daughte of 25 woud be described has having to give up her bcareer to go home to take care of her aged and grey haired parents . Then we discover that the parents are only in their fifties and have no illnesses except a touch or arthritis or a slightly elevated blood pressure. I don't know how many books I've read where the parents are described as elderly though only in their forties. In the picture of the indulgent mother, she looks as though she is the mother's old nurse or the girl's grandmother. The first girl does look as though she is either simpleminded-- and dressed as one would a doll-- or scared out of her wits. 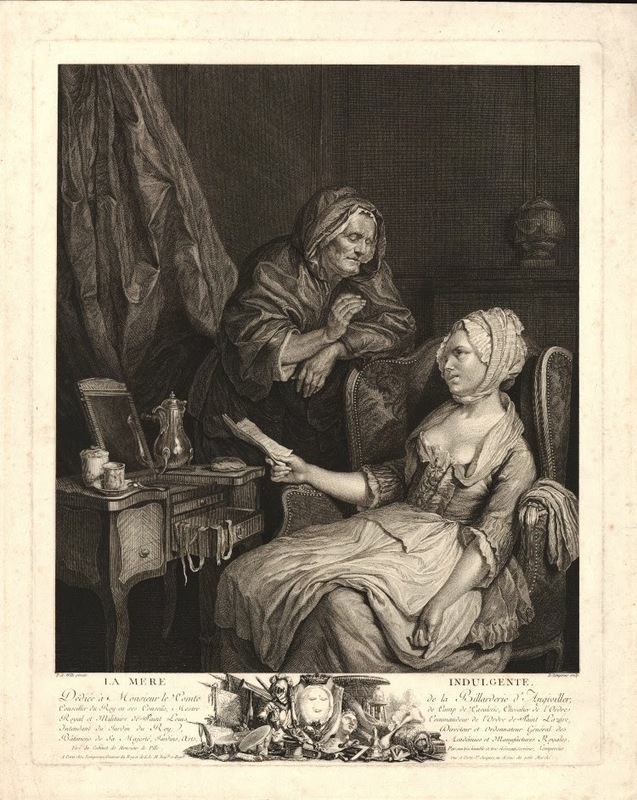 The notion of the early aging *( re: the wrinkled and old appearance of the Mothers in these prints), is not supported by Madame Sevigney's letters. The letters are a very detailed picture, as you probably know, of all aspects of life in France during the 17th century. Madame Sevigney herself was still considered a beauty in her 50s ( and younger looking than her daughter Mmme Grignan). Perhaps many women were worn down by life ( no doubt), but I think this idea isn't sufficient to account for the appearance of the mothers. One note: Conseils maternels translates more precisely as "Maternal Advice" not "Wise Mother." I'm not sure that this changes the interpretation of the print, but maybe it does "recast" the women in some way.